Do you have droopy eyelids? Dr. Dutt uses a CO2 laser procedure to lift the eyelids, reduce fat pads, and resurface wrinkled skin. Your medical insurance may also pay for your procedure. Contact us to learn how laser eye lifts help reduce saggy skin giving you a younger, rejuvinated appearance. Is it ok for the patient to drive after having the blepharoplasty procedure completed? NO. The patient will have taken a sedative and have blurry vision from the ointment. Transportation should be arranged. I have bags under my eyes. Would I be a likely candidate for the lower eyelid procedure? Yes, we would do a "no-stich" procedure. At what age does this procedure start to usually be indicated? When you feel it is and have the consultation with Dr. Dutt. How much bruising and swelling do patients typically experience and for how long following the procedure? Bruising is minimal to moderate. It can last up to 5 days to one week. You can cover it up. I have hypothyroidism and have what they call a pronounced eye. Am I candidate? Can a consult be done the same day as the surgery if I am coming from out of state? You must have the consult over the phone first with the doctor. Pictures can be e-mailed. Then a deposit is required, this is refundable with a 48 hour notice. Yes. I would need to see you for a consult first and possibly treat the problem. Is there issues with not being able to close your eyes after the procedure? Is there any eyebrow lifting that will occur as a result of having the eyelid surgery? There are no problems not shutting your eyes. Yes, a brow-lift is a separate procedure and can be done at the time of the bleph. surgery. Does the procedure result in a lifting of the eyelid to give a more open look? Does it remove all dropping? Yes, you willl see better. You may need Botox in conjunction. Can you explain the procedure? Do you remove skin, fat, and folds or is it a microsurgery process? 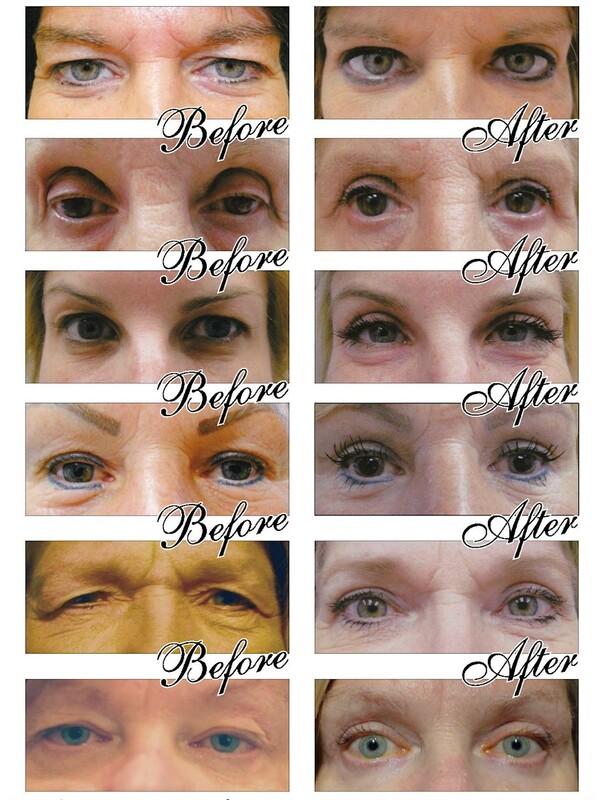 The procedure is done with a CO2 laser to remove both upper and lower eyelid skin, as well as fat pads. This ensures minimal bleeding with minimal scaring and a faster recovery time. How many offices do you work out of and are you with the Center of Cosmetic Surgery? There are three offices. Our offices are Luna Vision by Dr. Dutt. Dr. Dutt has performed hundreds of eye lifts, Botox, Skin Resurfacing, and Filler treatments. What happens to the loose skin after you remove the fat from the lids? How will it bounce back? Good question! The loose skin can be "resurfaced" with the required resurfacing tip on the CO2 laser. It's the same laser used to take off eye lid tissue. This is an extra charge. What does your office prescribe for general anxiety/relaxation before/during the procedure? A sedative must be taken prior to the treatment. We would direct on when and the amount before the surgery. Does this procedure include BOTH eyelids? Medical Insurance can cover the surgery, but only the Upper Lids. What is the usual down time for upper eyelid surgery, e.g., working, golfing, sun exposure? You can go back to work in two days or sooner. You might have to wear goggles. Trust your eye wrinkles to an opthalmologist. Botox, Juvederm & CO2 laser eyelid procedures and skin resurfacing are all available!